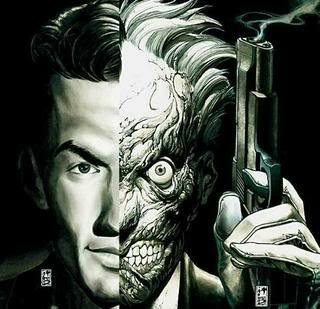 I've been very excited about the upcoming Batman film, "The Dark Knight", where both the Joker and Two-Face make their appearance. I've been a Batman fan off and on since I was a child. I've even tried writing my own Batman stories but they always fall short; something about the symbolism or metaphors just strike me the wrong way. And I started thinking about that earlier in my kitchen while listening to dark edgy music. Why is it that I am so excited about the prospect of a second well-made Batman film, and yet I feel as a storyteller that something in its metaphorical brew falls short of personal value? When I thought on it I began finding some interesting answers. Something big happened long ago -- which some historians estimate at 200, 000 years ago -- that forever changed the Human psyche. Actually, two things happened: the arrival of unpleasant visitors and the Great Flood. The True Self was overwhelmed, and as when a person is traumatized they develop alternate personalities (schizophrenia), so too did the Human race. Thus the ego was born as a defensive mechanism, and the True Self has been shielded by it ever since. The Human psychosis has plagued our world for indeed a very long time, but with the coming of Pluto astrologers are calling this the Age of Awakening; a period of psychic cleansing, of revealing, facing the truth and searching for answers. With the end of the Age of Pisces we are entering the Age of Aquarius, and what has been will die and rot away to make room for the new. We are to undergo a period of death, darkness and confusion, before we can awaken from the ego. The True Self is fated to take rulership over humanity. There is, and will be, a struggle between good (nature) and evil (behind-the-scenes forces we've discussed in other threads.) But the mask of the ego will be removed, the easy way or the hard way; the truth must rise to the surface. Now what does this have to do with Batman as a symbol? He is the ego, donning the black armour and mask -- the True Self is hidden for protection. He battles primarily the Joker, who represents the force of the Human psychosis, and an assortment of others who get caught up in it one way or another. But all of them wear costumes and guises, hiding their true selves (or having lost them.) Writers of Batman often say, "Batman needs the Joker, the Joker needs Batman. One couldn't exist without the other." Well said. The Joker is the embodiment of anarchy, and Batman is the symbol for the defensive mechanism (the ego) which rises to defend the natural world from it. Thus the two were fated enemies, and their battle can never end in their universe of story; they are bound to each other like the 'good brother and the bad brother' of ancient myth. Batman exists in a world of fear; he is driven by fear and projects that fear into others in order to keep them on their knees before the tyranny of the system rather than rebelling and running amok downtown. The very first definition is 'someone who advocates or believes' in anarchy. Not who performs, but supports. That's interesting, because if a person felt someone who was killed deserved to die no one calls him a murderer, any more than someone who is pleased to hear that one of the major banks got robbed is called a bank robber. I've heard many writers of Batman use the word 'anarchy' a great deal, and in the comics there is even a villain named Anarchy. The director/producer of the new Batman films, Christopher Nolan, has revealed in a recent interview with IGN that he is personally afraid of anarchy. This is a feeling which many minds working in and behind the Batman universe seem to share, and they love the character Batman because he is the fear-driven defensive mechanism which fights to stop anarchy. But if you really study Human psychosis you will find that through freedom of expression it can be defeated, but through fear and restraint it can only worsen. Metaphorically speaking, Batman and the Joker created each other, and fight to support each other's causes. Batman thinks he is doing what must be done, but he is merely a tool of fear which allows the problem to continue -- or if anything, get worse. 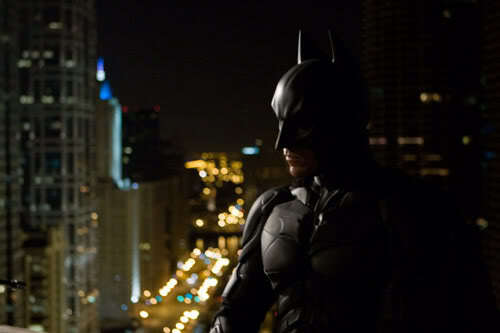 There was a good piece of writing at the end of "Batman Begins" when James Gordon asks Batman, "What about escalation?" Batman asks, "Escalation?" He hadn't considered that. Gordon explains, "We get semi-automatic weapons, they get automatics. We get Kevlar body armor, they get armor-piercing rounds. And you're wearing a mask and jumping off rooftops." One side of the extreme mirrors the other; that's why the Joker laughs in Batman's face and why Batman hates the Joker so; they are a mirror to each other. And so this is why I am fascinated with the symbols, how well the Batman story reflects the day-to-day struggles of social and political life. But at the same time, this is why I do not find the metaphors inspiring as a storyteller; I’d rather deal with facing the Truth Self and thus solutions.